Monks can become living weapons as capable of killing as any blade. 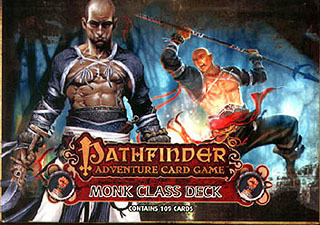 The Monk Class Deck allows players to bring these inspired warriors to any Pathfinder Adventure Card Game Base Set. This 109-card deck contains 3 new characters, as well as enough new and familiar weapons, spells, items, and boons to advance your monk through an entire Adventure Path. This deck can also be used in the exciting Pathfinder Society Adventure Card Guild organized play campaign.